Earlier today, the Texans agreed to sign former Broncos cornerback Bradley Roby to a one-year, $10MM deal. It sounds like the 27-year-old may have left some longer deals on the table, as the defensive back told Mike Klis of 9News in Denver that he turned down a three-year offer from the Steelers and a one-year offer from the 49ers. Roby said that the Browns were also in the mix (Twitter link). Roby left Denver after spending five years with the organization, and it sounds like the veteran holds a bit of a grudge against his former team. Free agent safety Tre Boston doesn’t expect to sign a deal right away, with the 26-year-old telling ESPN’s Josina Anderson that he expects to be in the “second wave” of safety signings (Twitter link). Boston said that three teams have already reached out to express preliminary interest, including the Raiders. However, following the team’s agreement with Lamarcus Joyner, it’s uncertain if they’ll still have interest. Boston spent the 2018 campaign with the Cardinals, compiling 79 tackles, nine passes defended, and three interceptions. Could the Chiefs signing of Tyrann Mathieu spell the end of Eric Berry‘s tenure with the organization? Pro Football Talk’s Mike Florio thinks so, as the writer can’t envision the organization paying a combined $27MM for the two players. Considering Berry’s recent injury issues, this isn’t a particularly hot take, but it’s worth noting that the Chiefs will have to make a decision relatively soon. As Florio tweets, another $7.25 million of Berry’s contract will become guaranteed on March 15th. A number of safeties earned large paydays yesterday, which was a significant difference from last offseason. CBS Sports’ Brady Quinn explained why safeties were the bigger winner during the NFL’s first day of the legal tampering period. The Texans have agreed to sign former Broncos cornerback Bradley Roby, according to James Palmer of NFL.com (on Twitter). It’s a one-year deal worth $10MM, a source tells Palmer. This marks a key investment for the defending AFC South champions, who saw two key members of their 2018 secondary defect. Kareem Jackson is likely set to take Roby’s place as the Broncos’ No. 2 cornerback. Roby’s deal illustrates both the cornerback market and his uneven contract year. Denver’s nickel man for four seasons behind Chris Harris and Aqib Talib, Roby struggled as a full-time player in 2018. He played a key role for the Broncos’ dominant Super Bowl defense and an elite pass coverage crew a year later, but the former first-round pick probably could have secured a long-term deal with a better contract year. Houston does not have much in the way of long-term pieces at corner, having Roby on a one-year deal and Johnathan Joseph going into his age-35 season. The Texans never received a quality return on their Kevin Johnson investment and is now without Jackson, who was the longest-tenured Texan on last year’s team. Houston also benched Aaron Colvin last season, so more moves may be coming for the Texans at this position — either through free agency or the draft. For Roby, this is a chance to re-establish his value. While a $10MM accord is a solid payday, it’s a fraction of what the soon-to-be 27-year-old defender could earn if he bounces back next season. Nick Foles is going to be a Jaguar. The Super Bowl MVP agreed to terms on a four-year deal with the Jaguars, with a base value of $88MM. While Foles cashed in, he didn’t have much of a choice on where to go. There were “no significant other suitors” for Foles’ services on the open market, according to Mike Garafolo of NFL Network (Twitter link). In the video posted to his account. Garafolo explains that Jacksonville was essentially bidding against themselves, but didn’t mind overpaying. Garafolo reports the Jaguars wanted to pay Foles more than they had to, so that he would have the immediate credibility in the locker room of being the unquestioned starter. The Jags thought it would’ve sent the wrong message if they had lowballed Foles and tried to pay him something in the $15MM range, and that it would’ve diminished Foles’ standing. Having Foles being able to step in and manage all the large personalities in their locker room is very important to the team, Garafolo notes. Broncos cornerback Bradley Roby is “getting a lot of interest” from teams, according to James Palmer of NFL Network (Twitter link). Palmer reports that the competition for Roby seems to have narrowed down to the Texans, Browns, Steelers, 49ers, Raiders and Broncos. 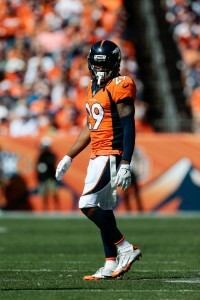 Everything we’ve heard recently has indicated Roby will be walking in free agency, so it would be a bit of a surprise if he returned to Denver. A 2014 first round pick, Roby has been a solid player but has never quite lived up to his draft status. He started 15 games for the Broncos last year. Texans defensive lineman Christian Covington isn’t ruling out a return to Houston, but the team plans to let him test the open market, according to Aaron Wilson of The Houston Chronicle. Wilson reports that Covington is expected to have a “healthy market” in free agency. Covington has been a bit player for the Texans the past four seasons, but did have a career-high 3.5 sacks in relatively limited action last season. The Saints are “still hoping” to retain Mark Ingram, but they aren’t going to break the bank to do it, according to Dan Graziano of ESPN.com. Graziano writes the Saints won’t be willing to pay much more than the $4MM they gave Ingram last season. A split could make sense for both sides if Ingram is looking for a raise and New Orleans is looking to give Alvin Kamara even more touches. While the Antonio Brown saga might seem like it’ll never end, a resolution could actually be forced relatively soon. “The Steelers will try to trade Brown sometime during a five-day window that begins March 13, when the new NFL season opens, and March 17, the date on which the Steelers would have to pay him a $2.5 million roster bonus”, writes Tim Benz of the Pittsburgh Tribune-Review. It makes sense why the Steelers have no interest in paying him the roster bonus, and if that’s the case we should know where Brown will be playing next year within the next couple of weeks. Steelers GM Kevin Colbert confirmed yesterday that three teams have inquired about a trade for Brown. Having a set date they need to trade him by would seem to reduce Pittsburgh’s leverage in trade talks. League executives are already saying they don’t expect the Steelers to fetch more than a third round pick. The Broncos won’t be re-signing cornerback Tramaine Brock this offseason, according to Mike Klis of Denver 9 News. Klis also writes “the odds aren’t great for” fellow cornerback Bradley Roby being brought back, so Denver’s secondary will be undergoing a significant amount of turnover this offseason. Denver’s once vaunted ‘No Fly Zone’ is a thing of the past, and the team needs a young cornerback to develop next to Chris Harris Jr. Brock is 30, and coming off a down year, he could struggle to find a ton of interest on the open market. Roby was Denver’s first round pick back in 2014 and started 15 games last year, but has mostly been a disappointment and fallen out of favor with the front office. The Ravens signed cornerback Tavon Young to an extension a couple of days ago, and they might not be done handing out new deals just yet. Left tackle Ronnie Stanley, outside linebacker Matt Judon, and kicker Justin Tucker are all “logical candidates” for extensions as they prepare to head into the last years of their contracts, writes Jeff Zrebiec of The Athletic (Twitter link). Tucker remains the league’s best kicker, so the team will almost certainly prioritize a new deal for him that should break records. In case you missed it, the Patriots’ McCourty twins have both announced they plan to continue playing in 2019. The Chargers have not made much of an effort to target Philip Rivers‘ heir apparent yet. Because the plan still appears to be a semi-long-term future with their current starter. Extension talks between the Bolts and their 37-year-old quarterback are set to commence. Rivers confirmed no such discussions have unfolded yet, but going through his 15th season did not change his mindset to avoid retirement for a while. The 2004 first-round pick gave the “year-by-year” answer during a radio interview with San Diego’s XTRA 1360 (via Pro Football Talk) before adding he believes he has a “handful” of seasons left. In the final year of his latest contract, Rivers is due an $11MM base salary and $5MM roster bonus in 2019. A $23MM cap charge is attached to this deal, and another re-up would bring that down. Los Angeles is projected to hold middle-of-the-pack cap space ($25MM-plus). Although Domata Peko‘s two seasons in Denver doubled as the Broncos‘ worst two-year stretch since the early 1970s, the veteran nose tackle rewarded the team’s modest investment. Again a free agent, Peko wants to continue his stay in Denver. “Of course I want to be back,” Peko said, via Jeff Legwold of ESPN.com. “I love it here, love these guys, you don’t know what they’re going to decide. But I feel good, like I can play.” The Broncos saw more improvement from Shelby Harris, an RFA who could be in line for a hefty raise. Harris could slide in and become Denver’s new starting nose, but Peko, at 34, may not cost too much to retain as a part-time player. Pro Football Focus slotted the longtime Bengals nose man as this year’s No. 42 interior defender. Conversely, the Broncos’ half-decade run with Bradley Roby is expected to end, per Legwold. Neither Roby nor 2015 first-rounder Shane Ray are expected back in Denver next season. The Broncos have a solid glut of impending UFAs, with Matt Paradis and Shaquil Barrett joining Peko, Roby and Ray. While the Broncos have Von Miller and Bradley Chubb residing as one of the NFL’s best pass-rushing duos, their formerly formidable cornerback corps will be incredibly thin without Roby. All-Pro Chris Harris is still under contract, but for just one more season. One of the workout circuit’s most popular players, free agent punter Brock Miller received a look from another team recently. The Rams employ All-Pro punter Johnny Hekker, but with the Patriots featuring left-footed punter Ryan Allen, Los Angeles brought in the left-footed-punting Miller for a look, Ian Rapoport of NFL.com tweets. Miller has received several workouts like this but been more than a de facto scout-teamer, being part of the Giants’ practice squad last month. One team that will likely be undergoing a lot of change this offseason is the Broncos. Vance Joseph seems almost certain to be fired at the end of the season, and the shakeup will likely go well beyond the coaching staff. John Elway will have decisions to make about a lot of the roster, including quarterback Case Keenum, and there will be some tough calls. To preview the tumultuous offseason ahead, Nicki Jhabvala of The Athletic took a look at the roster and projected who is likely to be gone in 2019. We’ve already known that outside linebacker Shane Ray and safety Su’a Cravens are extremely unlikely to be back in a Broncos uniform next year, and Jhabvala thinks several other big name defenders are in danger as well. She writes that cornerback Bradley Roby and linebacker Brandon Marshall, both starters the last few seasons, are both unlikely to be brought back. Jhabvala notes that the team traded Aqib Talib this past offseason because they were confident Roby was ready for a bigger role, but they’ve since soured on the 2015 first round pick. Among other players Jhabvala lists as being in danger are center Matt Paradis, who she thinks might be priced out of the Broncos’ range, and guard Max Garcia, who had already been demoted before tearing his ACL earlier this year. The Raiders are still looking to upgrade their secondary, but they now view third year safety Karl Joseph as a building block for the future, according to Scott Bair of NBC Sports. Bair writes that the team was shopping the 2016 first round pick at the trade deadline, but is now “happy they didn’t deal him” because of his play the second half of the season. The West Virginia alum has received very good marks from Pro Football Focus, especially recently, and has been a large part of Oakland’s recent resurgence. The Seahawks clinched a playoff berth with their huge win over the Chiefs last Sunday night, and got even more good news this week. Starting guard J.R. Sweezy suffered what initially appeared to be a serious foot injury, but coach Pete Carroll said he thinks Sweezy will be able to play in the first round of the playoffs (Twitter link via Brady Henderson of ESPN). Sweezy has started every game this year for Seattle’s reborn offensive line, and while Carroll is notoriously overly optimistic when diagnosing injuries, this is still good news. Speaking of the Seahawks, their defensive tackle Shamar Stephen “is closing in on a significant incentive bonus”, according to Henderson. Stephen is due a $500K bonus if he plays between 45 and 49.99 percent of Seattle’s defensive snaps, or $700K if he plays between 50-54.99 percent. Stephen is currently playing 50.16% of their defensive snaps entering their Week 17 game, so he’s on track to hit it. Considering Stephen’s base salary this year was only $800K, this would be a massive bonus for him to reach. Cornerback Bradley Roby is set to hit free agency in the spring, but he’s hoping to stay put. With longstanding ties in Denver, the 26-year-old says he wants to re-sign with the Broncos. The versatile veteran has started in all 13 of his games this season and it stands to reason that the Broncos would want him back at the right price. After signaling his desire to sign a new deal in Denver, there’s a possibility that he’ll accept a hometown discount and forgo his chance to entertain other offers. Through 15 weeks of the NFL season, Pro Football Focus has Roby ranked as just the 93rd best cornerback in the NFL out of 116 qualifiers. It’s a dip from his work in years past, including his career-best showing in 2017. The Broncos wrap their season with games against the Raiders and Chargers. We learned earlier this morning that Buccaneers wide receiver DeSean Jackson has requested a trade, though the team wants to keep him. Rick Stroud of the Tampa Bay Times tweets that Jackson, on his way to the team bus this morning, declined to comment on the report. Albert Breer of TheMMQB says that the Raiders may not be done dealing just yet, though he does not expect the team to move Derek Carr (indeed, Adam Schefter of ESPN.com reported this morning that the Raiders have told Carr that he is the quarterback of the present and future). However, Oakland is open to moving Karl Joseph and Gareon Conley, though the Raiders are driving a “hard bargain” with teams interested in Conley. Breer names a number of other players whose names we have not heard in recent rumblings but who could nonetheless be on the move: the Packers‘ Ha Ha Clinton-Dix, the 49ers‘ Pierre Garcon and Jimmie Ward, the Cardinals‘ Chandler Jones, and the Broncos‘ Shane Ray and Brandon Marshall. Breers adds that San Francisco would need to get something “significant” to deal Ward. He also says that, while teams are certainly interested in Denver corners Bradley Roby and Chris Harris, he thinks it would be difficult for the team to trade either. If they had elected to trade Patrick Peterson, La Canfora writes that the Cardinals could have received a bounty for him, and may have even landed multiple first-round picks (in fact, several teams were already prepared to offer a first- and second-rounder). JLC reports that Peterson was considered the “crown jewel” of the deadline, and given his attractive contract status, he may be the subject of renewed trade rumors during the offseason. Breer also writes that the Browns are open to trading Tyrod Taylor, whose contract structure could make a deal feasible. Meanwhile, Tony Grossi of ESPN.com suggests that Cleveland GM John Dorsey may be trying to acquire wide receiver help (Twitter link). The Bills remain unlikely to trade LeSean McCoy, per Schefter. Jets GM Mike Maccagnan has demonstrated a proclivity for making trades, and Rich Cimini of ESPN.com says Maccagnan has been doing his due diligence on everyone, including big-name players. But while there is a sense that New York could swing a deal, the fact that the team is in a no-man’s land between buyer and seller, and the fact that the roster does not have many tradeable pieces, could make a trade difficult to pull off.